I stumbled onto a blog called Goodeness Gracious a while back and her wealth of recipes hooked me in. 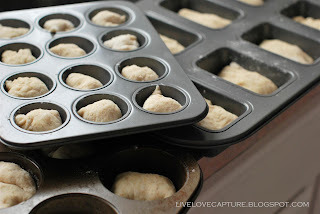 The first recipe that I saw and wanted to try was these yummy Benefiel Yeast Rolls. I loved how the original recipe was on this scrap of old paper. Yesterday we had some friends over for supper so I decided to give this recipe a go. You can find the full recipe here. It was super easy to make and the rise time isn't as long as you'd think. This is the risen dough after about 1 1/2 hours. I just turned on the oven for a quick second and turned it off. Popped the dough in the warm oven to rise and it worked like a charm! 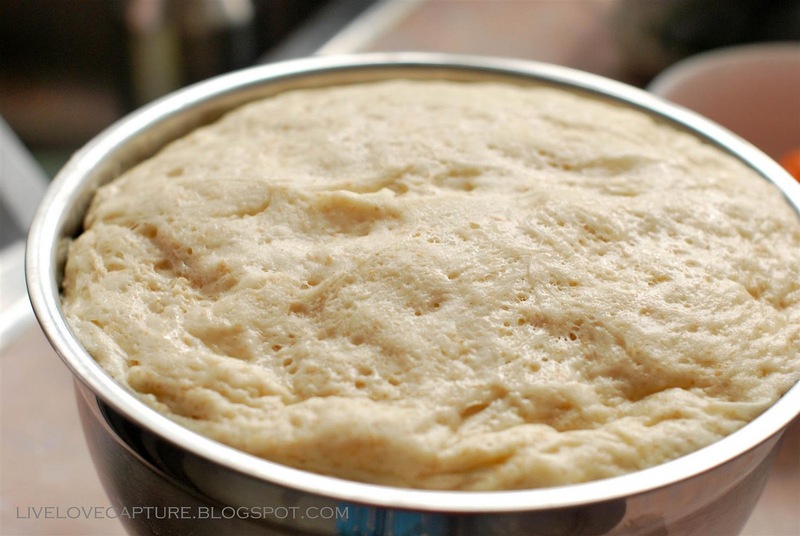 After the dough rises, you need to cut it up and let it rise again. The picture above is before the dough had a chance to rise a second time. 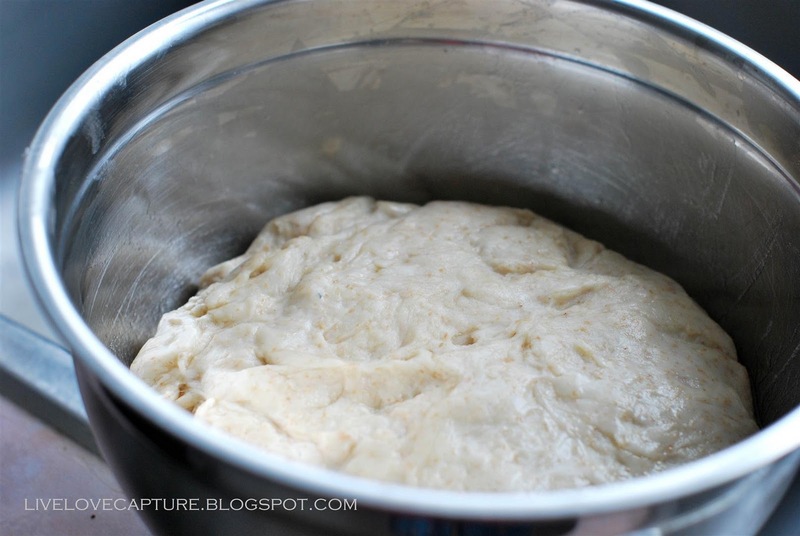 I don't have a picture of the second rising because it deflated really quickly and I needed to get them in the oven asap! Notice how insanely browned the bottoms are? The recipe called for 400 degrees for 10-15 minutes. 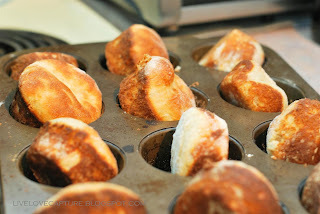 These little pockets of tasty were only in the oven for 8 minutes! I think the next time I make these, I might try 375 and keep a closer eye on them. They were very very tasty and definitely worth making. Thought I'd share what Jamie was doing while I was baking. Walking a white fluffy dog in the spring is not fun. I've been meaning to go to the Alberta Avenue Farmers Market for the last few months but with work, it was difficult finding time. This past Thursday was my one and only evening off so I took the opportunity to visit the little market. You can find more information about it here. Although it's small and quaint, there's a lot of things to choose from! I came home with a few goodies. I knew I wanted to try some pickled goodies and carrots are always full of crunch. 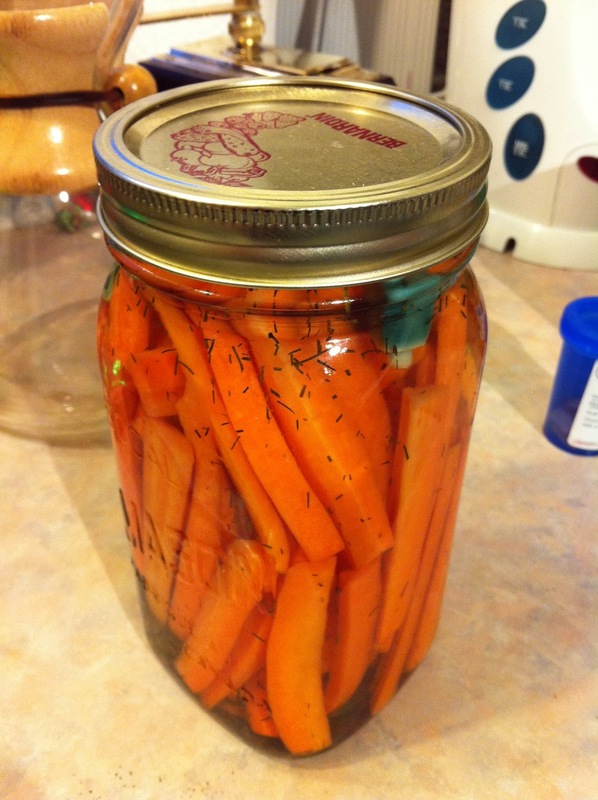 When I'm done all these, I'll just throw in a few more carrots from the fridge to take advantage of that yummy brine. This big jar cost $6. My second stop was Queen of Tarts Bakery & Bistro. 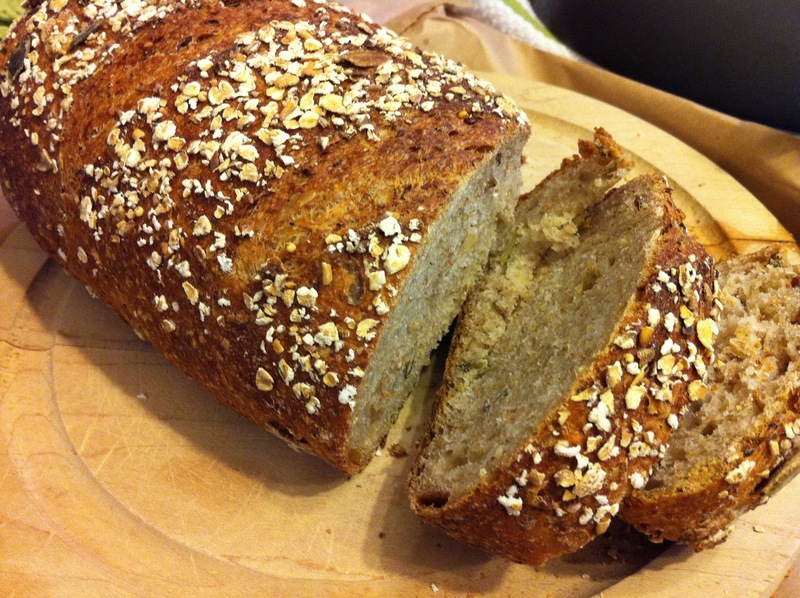 I don't remember the name of this bread but it was full of organic flour and pumpkin seeds. I've had toast the last 3 days. This tasty loaf put me out $5.50. The last and final stop was at Shooting Star Ranch. Daisy had tried their breakfast sausage and was highly recommending it. I've got a weakness for sausage and was about to buy the ham garlic sausage at another booth when the sample of elk sausage hooked me in. It was so stinkin' tasty I snuck in 3 samples. It was also very affordable to buy! That ring in the picture only cost $5.85. The ham sausage was going for $7. 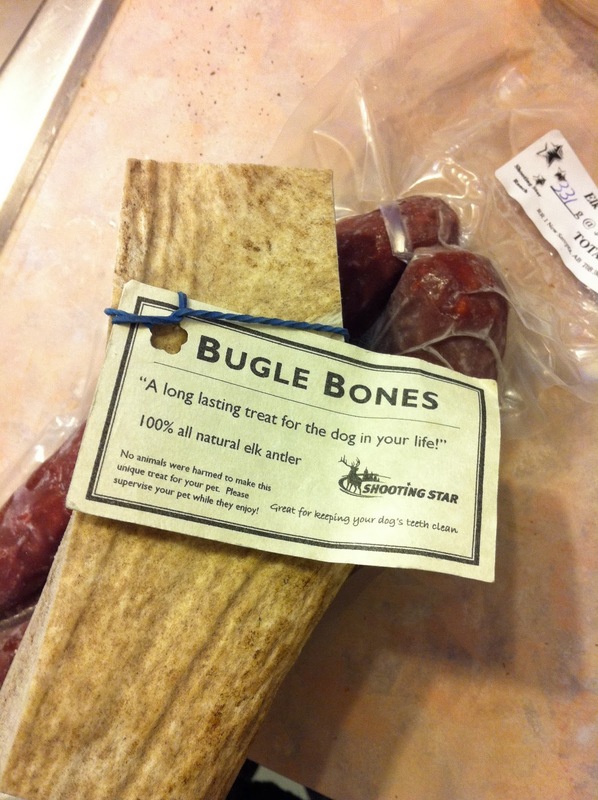 Jamie had also recently bought Khuno an elk antler to chew. Khuno devoured half the antler in one evening so this bigger chunkier antler was right up Khuno's alley. If you haven't had time to stop by the farmer's market on Alberta Avenue, it's definitely worth the trip. There was produce, meats and organic grains. It runs all year round and it's indoors! Parking is ample and the atmosphere is super cozy. Does that photo look familiar? I had posted about eating Marilyn's famous Laksa a couple weeks ago. While I was grocery shopping in chinatown, I stumbled across a jar of laksa sauce. The directions on it seemed quite simple. Put in the jar of laksa sauce with water, add toppings and eat. That's exactly what I did! I took the entire little jar of laksa sauce (no photo, sorry!) and fried it in a pot. The oil splatter was so intense I only managed to fry the mix for about 10 seconds. I doused it with chicken broth and water and put a lid on it. The little jar packs some intense flavor! I only needed to add extra water and a touch of fish sauce. I finished it off with some coconut milk. Not nearly as many toppings as Marilyn but I was too lazy to leave the house. I harassed Jamie to pick up bean sprouts though because I wanted a bit more veggies in the dish. I served it just like Marilyn did with vermicelli noodles. The broth wasn't as tasty as Marilyn's but it was good enough. I'll need to bug her for her secret. Perhaps it's the special shrimp paste that her mom makes. Daisy was over for supper and she also mentioned this homemade paste. It was one busy weekend! I had to work both Thursday and Friday evening. We ended up going to Cafe Select downtown for Julie's birthday dinner. I don't think I have ever eaten there but I did try to go for dessert there once with some girlfriends. The lady asked us if we were going to eat and we told her we'd be ordering desserts. The lady refused to seat us because we were only going to order desserts! Well anyways, on Friday the experience was no better. We got there and for groups larger than 8, they charge an automatic 18% gratuity. We had 14 (I think) in total. I'll just do a quick run through of the evening. We ordered the Wild Mushroom Fondue for 4 to start and a "dinner" to share. The "dinner" was part of Downtown Dining week and came with calamari, chicken florentine and creme caramel. The mushroom fondue came over 30 minutes later but the chefs accidentally put wine in it. We opted to not get it replaced and instead ordered 2 entrées, mac & cheese and linguine with prawns. The waitress clarifies the order because she thought I wanted mac & cheese with prawns so I tell her, "No, mac & cheese and the linguine with prawns". Another 30+ minutes go by and the linguine and chicken come. After we finish those, 20 minutes go by and the waitress comes to clear our plates. We tell her that we're still waiting for the mac and cheese. Turns out, the waitress thought I had just wanted the linguine with prawns. As the waitress points out, "Bad things don't usually happen to the same table." The final strike is for dessert, she comes to us and goes, "We're actually all out of the creme caramel but we can give you a creme brule". That worked out for the better but at the end of the day this is what we got. Mediocre tasting overpriced food that took way to long to find it's way out of the kitchen. Not sure if the kitchen was having a bad night or what the deal was but our lovely waitress still got her %18 gratuity despite us having, well, no food! Did she do anything for us to make up for the kitchen's issues? Of course, she did not. That place has officially been crossed off my list of places to go. Onto somewhere that was tasty now! We had a surprise engagement party for Le Bao at Kyoto. We all shared a bunch of different items and it was not only affordable and delicious, but it was faster and they actually got our orders correct. After dinner, we had a night of games for Le Bao and it was great fun! It's too bad I had to work all darn weekend and with daylight savings, we lost 1 hour of fun times that could've been had yesterday. As Murphy's law always works, today also had to be insanely busy at work. I ended up working straight from 9:15-4:15 and took my lunch break at 4:15. I couldn't even fill myself up on water in between clients because then I'd need to find a bathroom! I got home not long ago and decided it was time for another drink. One might call this ghetto sangria but as Julie pointed out, it's actually quite classy! Why? If Sorrentino's can use their house red wine with Oasis fruit punch to make sangria and charge $8, I'd call that classy! Cheers! So a week or so ago, I had finally managed to clean out our old dead potted herbs along our kitchen window sill. We originally tried growing herbs in Sumisoil. Those are the little red beads you see in the photo. I didn't really like it so we let those herbs rot and die. I like the idea of dirt more so I bought some a bag at Dollarama for $0.50 and sprinkled in a few Sumisoil beads to help maintain the moisture in the plant. This was maybe a week after planting. Then in a matter of 2 days, I came to the window sill to find this! I was ecstatic!!! We get a lot of sun at our kitchen window and boy does this little pot like it. Another 2 days go by and today I came home to this!!! You can tell which way the pot was facing. Look at all those lovely little sprouts leaning towards the glorious sun! We planted two pots. One has thai basil and the other has cilantro. I'm really not sure which one this is. The other pot is really sad. Take a look. If you click the picture and zoom in, you'll see the tiniest little speck of green starting to poke out. This one is definitely stunted. I'll keep you posted on the progress of my little window sill garden! Bissell is having a MVP contest and I submitted Khuno's picture. Feel free to visit his picture and vote! He can be found HERE. Just a quick post before bedtime. 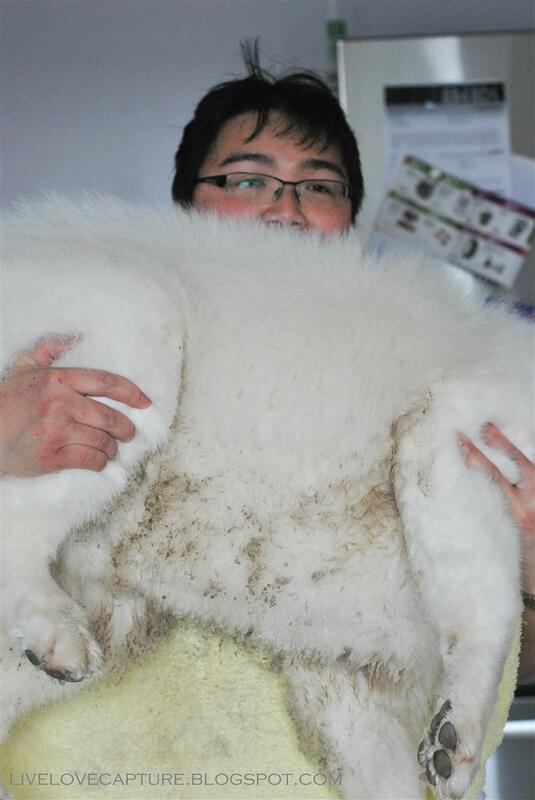 I was searching through some old photos and stumbled across these adorable ones of Khuno! He had just finished playing in the field with another dog I do believe. His fur turns all gross when it's wet. Today my girlfriends got together to throw Marilyn a surprise engagement party and surprise her we did! 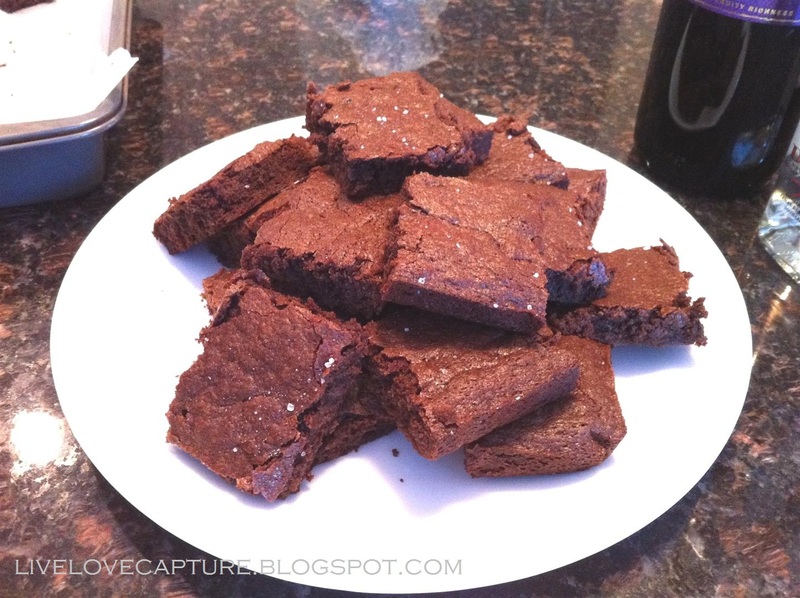 It was also a potluck so I decided to whip up a batch of brownies. I ended up sleeping in today till 2 PM. That's correct folks, PM. As in 2 in the afternoon! It's sickening how much I can sleep. I could've snoozed a bit longer but realized that 2 PM is just sad. So after showering and eating... lunch? I whipped up the brownies and literally threw them in the oven. I just used the recipe off of the Baker's Chocolate box. Super easy and fast to whip up. I think I can even rattle off the recipe off the top of my head... Lets try! 1. Chop up the chocolate and put into a medium sized microwaveable bowl with the butter. Heat in the microwave until melted. 2. Add sugar, eggs and vanilla. 4. 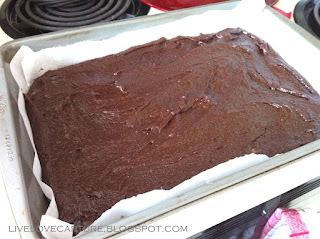 Bake in a 9x13 greased (or parchment lined) pan at 350 F for 30-35 minutes. Do not over bake!!! It only took about 27 minutes for me. I think that's it. I tried halving the recipe before and it's not as tasty. When I pulled it out of the oven, I finished it off with a sprinkling of salt. I have to write about this because my blood boils when I think about it. When Jamie was hunting for my engagement ring, he found a specific designer that he thought I would like. Only a few jewelry stores carried this designer, one of them being Swedish Jewellers. He ended up buying the ring and matching band there but not the diamond. Although he knew my left ring finger fit smaller than my right, he didn't realize just how much smaller. Despite buying the ring in a 1/4 size smaller, it was still slipping off. I ended up bringing it into Independent Jewellers to get it resized down to a 5. It cost $35 and took a few days. Now after wearing it for a couple months, I realized that it is still too big. I called up Swedish Jewellers and asked if they do free resizing since Jamie bought the ring and band there. The person I spoke with said, "Sure, bring them in and we'll work something out." Since it was Christmas time and they said it'd take a week or so to resize, I opted to wait until after the holidays. So come January and I bring the rings in to Swedish Jewellers. I dealt with Kim and David. I told them I had called asking about free resizing since both rings were purchased there. David took a look and had me try them on. Sure enough, he agreed they were both too big. He asked why the rings were ordered so big and I explained how my left fingers were smaller than my right. He still didn't understand why they didn't fit because "we order to size". After a few attempts he goes, "Oh, so we've never had you in the store to measure you!" Hmmm, does every man bring his future wife in to get her ring size measured? Has David ever heard of surprise engagements? Anyways, I drop off both rings. After 2 1/2 weeks of not hearing from them, I called. The sales associate on the phone wasn't friendly. I said I had dropped off rings for resizing and was wondering if they were ready. "There's nothing in the ready box." So I asked if she could give me an idea of when they would be ready. She tells me she will look and call me back. Does she call me back? Of course not. I call back the next day and they say the rings should be ready by the end of the day or the next day. I get a call at the end of the day telling me the rings can be picked up tomorrow. So I go in the next morning to pick them up. It's Thursday and Kim is working. He hands me my ring. I tell him there were two rings so he digs in the envelope a bit more and finds it. After putting them both on, I'm satisfied enough and am ready to leave since I parked in the loading zone. Kim then says, "That'll be $200". What. The. F&*#. I calmly tell him I was under the impression they were going to get resized for free. He asks who I was dealing with and I tell him "You were here the night I dropped them off." So he goes to the back to find David because he does the pricing. David comes out and asks what the problem with the price is. I tell him the same thing I told Kim. David tells me that he spoke with the "Al" and because they ordered the ring in the size Jamie wanted, it wasn't the store's fault the rings don't fit so resizing wouldn't be free. I tell him I don't understand why the cost is $200 and he raises his voice at me saying, "Do you have any idea how much work it is to resize rings like those?" I tell him I've had them resized before for $35. So then David brings up that the rings were re-plated with rhodium and that future re-plating is complimentary with ring purchases. So I ask again, how much would it cost to resize without the plating. $50. So now I'm upset and confused. Why $200? Because of the plating. But I thought re-plating was complimentary? It's because I got the ring resized. So I tell him I'm upset because it was supposed to be done free of charge, to which he yells back at me, "You can't go through life expecting everything for free." He storms off into the back leaving myself, Kim and the 2 other employees in shock. David comes back out and says that even though he doesn't have authority to change prices, that he'll take off $50. What else can I say at this point? I pay the stupid $150 and leave the store crying. I cry for an hour straight. Why so long? Because I was livid. I was so mad I felt like turning my car around and driving it through their store front. So I tell Jamie what happened and Jamie's mad. He plans on going into the store the next day to talk to Al, the store owner. Is he in the store that day though? No. So we spend the whole weekend calling to see when Al will be in and we get nowhere. Finally Monday comes and Jamie goes in to the store to talk to Al. Jamie has given them a lot of business and he dealt with Al for the ring purchase. Jamie is calm and collected. He tries to get Al to see where we are coming from. Al's argument: He agrees that the store should have called us to confirm that we still wanted the work done with the estimated cost, "...but most of the clients we deal with just want the work done." So he recognizes they are wrong but "...I can't refund your money because she still agreed to pay it." How does this make any sense? So after 45 minutes of trying to get Al to see all the things the store did wrong, he agrees to only give us a store credit. Is that what I want? No! They still have the $150 that I wasn't wanting to spend there in the first place. Had I known it was going to cost, I would have brought it anywhere else and it would have been done better, faster and cheaper. I feel taken advantage of, belittled, bullied, scammed. So that night, Jamie comes home to tell me that's all he was able to do. He also asked me if I had checked to see if my diamond was secure because making a ring smaller will cause the claws on the diamond to pull away. Makes perfect sense. So we check and we find a loose diamond. Are you freaking kidding me?!? It takes them 2 1/2 weeks and they do a crappy job??? Unbelievable! So Jamie takes it in the next day for them to fix their crappy work and they assure us it will be done free of charge. "We'll put a rush order on it." 8 days later, it's finally ready. 8 days to tighten the claws!!! Now what happens yesterday while I'm at work? I am in the washroom and I look down at my ring and what do I see? A MISSING DIAMOND!!! How ridiculous is this? I never ever EVER want to deal with Swedish Jewellers again. I will not recommend them to anybody and I will do everything I humanly can to share my awful experience with them. They are shady, have terrible customer service and take a long time to do crappy work. So now we're stuck replacing a lost diamond when I've only had this ring for 5 months. I. Hate. Swedish. Jewellers. Jamie's mom hates curry so whenever she is out of town, we try to take Jamie's dad out for Indian cuisine. So on Wednesday I'm all excited to go for an all you can eat Indian buffet, but Jamie's dad decided it was too cold to go out. After craving it all day, I dragged Jamie out to eat it anyways. We live quite close to Maurya Palace on the north side and for $15.99 (I think...) it was going to have to do. This is my first of two plates. Just a little taster plate. Jamie skipped the saffron rice and I made the mistake of taking some. Not because it wasn't tasty but because I forgot all about the naan bread!!! Now fast forward to today. Jamie took some chicken breast out to defrost so I suggested we make chicken boona. I've never seen chicken boona anywhere else except for the little mobile stand "Curry N Hurry" found at all the Edmonton festivals. I eat it every time I go to Capital Ex. We've tried to recreate the dish and have been somewhat successful in the past. I haven't made it in a long time so I tried looking for a recipe. After searching "chicken marsala", I realized I was looking for the wrong thing! Took me a while to figure out I was looking for "chicken tikka masala". Can you believe there's only one recipe on allrecipes for this? I'm not counting the second recipe because it had like 2 stars... I didn't follow the recipe exactly because I didn't want to waste time marinating the chicken so I came up with my own version. 1. Cut up 2 medium onions and saute in a pot. 2. Cube 2-3 chicken breasts and add to onions. While the chicken is cooking, add 2-3 tablespoons of garam masala. Add in chopped garlic (we used an entire head). Continue cooking till chicken pieces are browned. 3. Add 1 tsp of cumin, 1 tsp of paprika, juice of 1 lemon, 1-2 tsp of Sambal chili sauce and salt (to your desired taste). 4. Add 2 cans of tomatoes and veggies of your choice. We used 1 red pepper and 3 stalks of celery. 5. Cover and simmer till the veggies are cooked to your liking and add 1/4 cup of sour cream. We like it really spicy and tangy so we mix Sambal chili sauce with vinegar and add it on top while we eat. Next time we'll try adding a can of tomato paste and see if it kicks it up a notch or not. We served ours over brown rice. (Side note: I hate cooking brown rice!) The pictures were taken with the iPhone using Camera + again! So yesterday Jamie and I had the honor of eating at Jason and Marilyn's house. What was the special occasion? Why, it was Jason's birthday! I just thought I'd share a couple photos of the delicious meal that Marilyn prepared. The photos were taken with my iPhone using an app called Camera +. Definitely worth $0.99! You start with a bowl of plain vermicelli noodles and then top it with an assortment of yummy items. Mar's prepped a huge amount for us to choose from as you can see from the picture. Finish it off with some spicy hot broth and dig in! I was really greedy with the toppings so I wasn't able to fit in round 2. Definitely something we'll need to try making in the future. Maybe with less toppings because man, that's a lot of prep! Thanks Marilyn for a tasty meal and we owe Jason a big thank you too for being born so that we could have this yummy birthday meal with you.